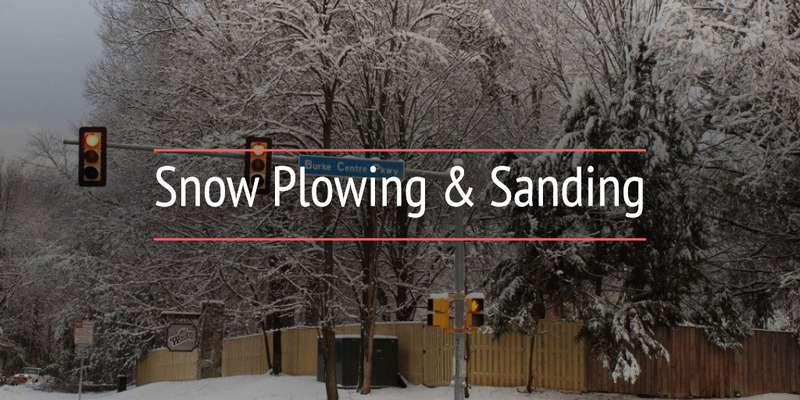 Within the boundaries of Burke Centre, different organizations handle the plowing and sanding treatment of roads. Please use the neighborhood street listings below to determine the organization that has the responsibility for plowing and sanding the street(s) affecting you. Please CLICK HERE to inquire about a street not shown on on any listings provided. Please note that for Burke Centre Conservancy-maintained streets, snow plowing operations normally do not begin until AT LEAST TWO (2) INCHES of snow has fallen. When the Conservancy crews plow snow, an access lane into and out of the street is provided only. The Conservancy is responsible for plowing and sanding private streets, including townhouse cluster parking areas. Shovel your driveway AFTER a plow has come through, if possible. If you must shovel before a plow has come, always shovel to the right, facing the street. This way, less snow will be pushed back into your driveway by plows. When snow is forecasted, don't park on your street or at the end of cul-de-sacs. If possible, park in your driveway to give plows room to work. If you must park in the street, park as close to the curb as possible. If you're out on the highway, keep a safe distance (two car lengths for every 10 MPH you're traveling) between you and the snow plow to protect your car from chemicals and abrasives. If you're in front of a plow, don't break suddenly. A heavy plow cannot stop quickly. Ice skating on ponds, lakes and retention ponds is prohibited for safety reasons. Due to fluctuating temperatures, it is not safe to venture on any ice-covered lake, stream or stormwater retention pond. Even if the ice is a foot thick in one area, it can be 1-inch thick just a few yards away. It’s impossible to judge the strength of ice by its appearance, thickness, daily temperature or snow cover alone. Ice strength is actually dependent on all four factors, plus water depth under the ice, the size of the body of water, water chemistry, currents and distribution of the load on the ice. If you fall through the ice, don’t panic. If there is someone with you, have them lie down on the ice to distribute weight over a wider area and pass you the end of a branch, rope, belt, coat sleeve or whatever is available to help pull you onto the ice, where you can roll or wiggle to safety. Several people can form a human chain with the lightest person reaching out to you. If you’re alone, get your arms onto the ice and kick hard with your feet to help lift you onto the ice, and then roll to safety.